Never scorn a woman. Never forget to invite her to an event. And never, never tell her she wasn't wanted when she does turn up unexpectedly. Don't believe me? Well just remember the havoc wreaked by evil Maleficent after she gatecrashed Sleeping Beauty's christening party. If you love holding a grudge and are less sugar and more spice, then you'll enjoy playing the ultimate in all of the Disney baddies in this magnificent, malevolent Maleficant Fancy Dress Costume. 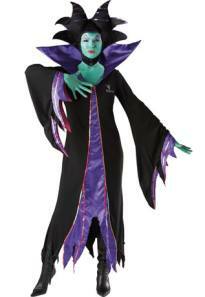 The outfit comprises of a black gown trimmed in purple with an attached stand-up collar. Also included is Maleficent's distinctive devil horned headpiece which fastens under the chin. This officially licensed Disney product is available in three sizes - small (8-10), medium (12-14) and large (16-18) and costs £53.99 online.